Salt is something that makes food tastier, but it’s also something we’re physiologically predisposed to crave. The saline content in our bodies helps regulate many of our day-to-day bodily functions, including our ability to absorb nutrients. Which is why—along with a lot of other “eat-it-or-you’ll-die” reasons, including its use as a food preservative—salt has had a place at the table since the dawn of tables. Hence, even as we speak, table salt is filled in hundreds of millions of tacky, porcelain shakers sitting in kitchens around the world; the flakier kosher salt called for in just about every recipe ever written; pink Himalayan sea salt for the cool set; and fleur de sel for the well-to-do set. And then there are seasoning salts—a mix of usually table or kosher salt, along with spices and herbs like garlic, parsley, paprika, and more—dashed into soups, on eggs, roasts, chickens, anything and everything. 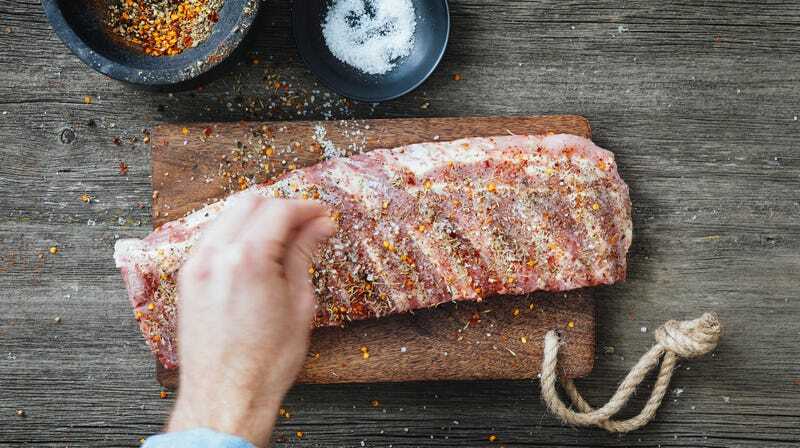 There are many varieties of seasoning salts, and they usually feature some sort of regionality, whether in the mix itself or the food it was meant to season (like the love affair between Maryland crabs and Old Bay). While the following is not intended to be a complete list, we’ve included a half dozen of America’s favorite regional seasoning salts, which in some cases, have gained cult national followings. Bojangles’ Famous Chicken ‘n Biscuits is a North Carolina fast food chain born in the late-1970s famous for well, its chicken and buttermilk biscuits. Bo enthusiasts will tell you that its Cajun Filet Biscuit sandwich is the equivalent to a thousand praying-hands emojis, but it’s its French fry seasoning that’s gained a massive following, thanks to Tar Heel expats able to buy it by the shaker via the chain’s website. The seasoning is slightly sweet, and follows through with just a touch of heat. Though touted for fries, Bo’s mix of salt and spices is equally effective on burgers, corn, and shrimp. St. Louis is the birthplace to several culinary monuments: the toasted ravioli, the confusingly named St. Paul sandwich, and the inexplicably overrated, but still beloved, St. Louis-style pizza made with a divisive cheese called Provel. Another beloved STL-bred food item, one that’s far less maligned, is Old Vienna Red Hot Riplets, which showcases St. Louis-style hot sauce (sweet and hot). This red hot, ridged potato chip, which is made by the Old Vienna brand with roots back to the 1930s, is a favorite amongst natives, and in 2017, the company decided to skip the chip and just packaged the seasoning salt. At Mac’s Local Eats in the Dogtown neighborhood, a kitchen window inside a dive bar serves arguably one of the best cheeseburgers in the Midwest, alongside fries seasoned with Red Hot Riplets salt. They’re endlessly addictive to eat, coating the fries in a brown sugar sweetness and a smokey heat that only seems to get hotter. A San Antonio landmark, the Bolner family’s grocery and meat market has been in business for more than 100 years; in the 1950s, a cousin developed a line of seasonings geared towards the Tex-Mex market, for dishes from tamales to menudo. Their steak seasoning is the perennial favorite, though, and showcases a little taste of the Southwest—it’s a red pepper and paprika forward mix with a sweet garlic bite, and a moderate amount of heat. Once upon a time Big Boys graced cities from coast to coast, where diners were greeted by a large, cherubic fiberglass child hoisting a large, fiberglass cheeseburger. “Great for everything on your plate!” is how Big Boy Seasoning advertises itself—its own retro packaging is another glimpse into the bygone era of Midcentury hamburger stops. Surprisingly, Big Boy seasoning salt is decisively epicure compared to others, with its use of curry powder (a spice mix with a long history in the country, but rose in popularity post-World War II) and shreds of dried parsley in the mix. Sweet and salty, it tastes like it was ahead of its time. Finding Big Boys along the roadside may be harder these days, but its seasoning salt lives on. A beloved salt of the Pacific Northwest, Johnny’s Seasoning Salt was created by its namesake Johnny Meaker, a proprietor of Crawford’s Sea Grill and Johnny’s Dock, who ran his restaurants on the shores of Puget Sound in the 1940s. In the mid-1950s, as home-cooking became big business, Johnny packaged his signature seasoning salt, and generations have sworn by it for use on just about everything from steak to eggs (including this site’s editor, a Seattleite). It’s a much more rustic seasoning salt compared to the rest on this list, with a big salt flakes and coarsely ground black peppercorns in the mix, rounded out with a paprika and garlic spice. When it comes to prime rib, your salt seasoning can make or break your roast. And once upon a time, when L.A. was the fancy prime rib capital of America (sorry, Wisconsin), Lawry’s was its star. Opened in 1938, the restaurant soon started selling its seasoning salt to patrons, and Lawry’s Seasoned Salt became one of the first commercially available seasoning salts—and like many stalwarts, it’s perhaps America’s most ubiquitous. From burgers to baked potatoes, its sprinkling knows no end, and it’s a time-tested secret ingredient for dad’s handmade burgers thrown on the grill. Even Richard Nixon was known to sprinkle Lawry’s on cottage cheese. Lawry’s also may be the most “basic” of the seasoning salts, as it has little color to it compared to other seasoning salts, despite advertising turmeric and paprika on the label—it’s very salty, and has just a hint of onion sweetness. In the end, it’s mostly just a fancy salt. For me, it’s those memories of the Lawry’s bottle on the picnic table during summer camping trips or my dad pulling a burger off the Smokey Joe that perhaps has me so fondly attached to it. I asked a couple of my North Carolina friends why they loved Bo’s seasoning salt so much, and one answered right away: “Nostalgia.” And that’s one more good enough “Eat it or you’ll die reason” for salt.